Manx National Heritage Chairman Tony Pass and Curator of Social History Matthew Richardson were on hand at the Manx Museum today to receive a donation of a carved bone paper knife, made in Knockaloe Camp on the Island by a German prisoner in 1916. 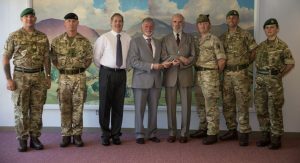 The donation was made by General Sir Lawrence New, on behalf of 6 Military Intelligence Battalion who are on the Island this week as part of a British Army recruitment drive for The Army Reserve. The week-long recruitment drive concludes on Sunday with a display by the Red Devils on 31 July at 19:00 at the war memorial in Douglas. The Army Re serve is an integral part of the UK Armed Forces and offers a wide variety of careers for both soldiers and officers, with over 200 different roles available. There are just under 500 Army Reserve units and sub-units across the country and anyone from the age of 18 upwards can apply to join. The Army Reserve typically trains for one night per week and at weekends. In many cases, Reserves also attend an annual two week training exercise. This is a lovely item which we are delighted to receive. Although we have quite expansive holdings of material made by prisoners in Knockaloe, we don’t have anything quite like this object, so it is important in that it adds depth to our collection. We are especially interested in hearing from Manx people who served in Korea, the Falklands, Northern Ireland, the Gulf or Afghanistan, and who may have memories or memorabilia which they wish to share with a wider audience. We would also be interested to hear from those who have been affected by conflict in other ways, or who have protested against it”. Manx National Heritage plans to open the new military and conflict gallery at the Manx Museum in just over two years’ time. If members of the public feel that they have material which would be of interest to visitors, please contact Matthew Richardson on 01624 648053 or email: matthew.richardson@mnh.gov.im . Staff Sergeant Rodney Rouchy, Major Daz Rawcliffe, Matthew Richardson and Tony Pass of Manx National Heritage, Sir Lawrence New, Major Espie, Corporal Dineen and Lance Corporal Davies of 6 Military Intelligence Unit. Bone Handled Knife carved at Knockaloe by German Prisoner of War, 1916.